It started before Trump was ever running. “Fake but accurate” I believe was a line they used once. Dan Rather Biased used it. Pity the #’s that have left, are not sufficient to force BOTH those networks off the air for good! I remember that. Rather got a super flimsy fake memo from GW Bush back when he was in the National Guard. It took 5 minutes for people on the internet to see that it was a forgery made using Word for Windows, which didn’t exist in 1972. As soon as this was pointed out, anyone in the Fake News Media with a brain backed off. But Dan Rather was no ordinary Media shill. He was the king of all shills. So he kept doubling down on stupid for the next couple weeks until his career imploded. He bled to death on Mount Word For Windows. Idiot. And when Bush told him to his face that the document was a fake, Rather demanded he still explain why he issued it. Bush just laughed at him. Idiot, I never issued that memo! Just how stupid are you? But… The American people need to know… FIRED. Schiff takes scumbag to a new level. Schiff claims he has all this prove about Pres Trump and if you question him about it all he says it that it is in plain sight. Schiff is a lying twit who has no proof just a big mouth. Schiff is about the last person that anyone should respect. 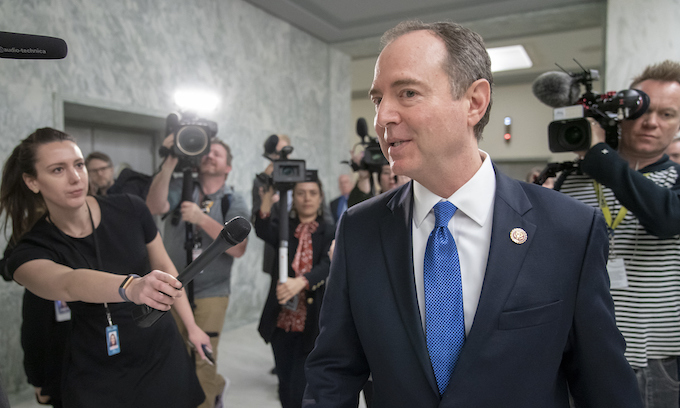 Too bad Schiff didn’t provide all his proof about Trump to Mueller since his investigators wern’t able to find any. Who knows, the results might have turned out differently. This jerk is so stupid he fits right in with the likes of AOC, those Muslims, and all those stooges running for president under the liberal democrat umbrella. God help us if any of those fools were to actually get elected to that office. To me, Meuller is just a face I see plastered on news articles like this. Regardless of political affiliation, I prefer to assume he’s not a total bonehead. Since Schiff kept saying over and over how he had all that proof, you’d think Meuller would make him one of his first stops. Let’s see your proof Adam. I could use it for my investigation. Surely, Meuller had to know Schiff had nothing. Literally nothing. Meuller was smart to finish the report when he did and slip back into the shadows. I think he’ll be forgotten quickly as the Media tries frantically to change the Narrative. That is unless Trump keeps using his report as a bludgeon to beat the Dems to a bloody pulp like they so desperately deserve. Couldn’t happen to a nicer bunch of traitors. I certainly HOPE they don’t let Mueller, just slink away, back into the shadows..
He’s not just a scumbag, but a rancid traitor! Hello, would you like to buy a subscription to the NYT? No thanks. I don’t own a bird. “Help us Obe Wan Schiff! Your your only hope!!! We might want to be careful about canning Ole’ Schiffty … they’d replace him with something much worse… dose “chairman” Cortez or Omar make you nauseated! Or even more sickening… appointing the useless deranged scum from my home state of Michigan Tlaib! How pathetic that Liberals continue to watch Fake News even though they KNOW they’re being lied to. It’s more than stupidity, it’s a mental disorder. The lying liars of the main stream of rancid sewage “media” are desperately clinging to some shred of ‘evidence’ (real or imagined) that demands further investigation by the rabid lunatics in the House of Representatives. Maybe trump did do something wrong that escaped Mueller’s attention thus justifying thousands of congressional hearings by dozens of committees so every person who has ridden with Elvis on a unicorn will have the opportunity to testify. Maybe has made an agreement with the orange beings on Saturn allowing them to impregnate human women. Maybe trump is negotiating to sell California to China in return for massive re-election contributions. Let the Dem’s continue to suspend any and all attachment to facts &/or logic &/or journalistic integrity and continue the publication / broadcast of wild assumptions and incredible accusations. Let them NEVER admit that anything they previously said could possibly be in error. Let their credibility crash and burn in an enormous fireball. Maybe Trump did do something wrong that escaped Mueller’s attention thus justifying thousands of congressional hearings by dozens of committees so every person who has ridden with Elvis on a unicorn will have the opportunity to testify. Maybe Trump has made an agreement with the orange beings on Saturn allowing them to impregnate human women. Maybe Trump is negotiating to sell California to China in return for massive re-election contributions.